Emergency Contacts: Do You Need Help? Karen Blackwood: So what does history have to do with mental health? Sophie Scott: Overwhelmed with responsibilities? Give yourself a break. Make a mentally healthy workplace your 2019 New Year’s Resolution! Wanted: 300 South Aussie dads-to-be! Eyre Peninsula residents: Join the conversation on mental health! SA Mental Health Commissioner Chris Burns: Don’t be afraid to put up your hand and ask for help. Julia Gillard: What do you think is Australia’s most common mental health issue? Mark Aiston: How the hell did I present sport to thousands of people on TV each night? When it comes to mentally healthy workplaces, it can be standing room only! 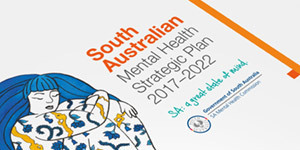 SA Mental Health Services Plan – Tell us what you think! SMS4dadsSA attracts 250 expectant dads so far! Delice Sauerwald: Dads are just as important as Mums! Izzy McMillan: Forget Netflix… my cure was in the paddock, waiting to be fed. Amelia Traino: One case of head lice away from chaos! Emma Willoughby: And so, this is Christmas and it can be full-on… and that’s ok! !